Monkseaton High School pupil Oonagh Stewart with Paula Clayton,'head of English. A teenager has been hailed a superstar by her teachers, after being ranked in the top one per cent of GCSE students in the country. Oonagh Stewart, 17, joined Monkseaton High School in October last year, after moving to the area with her family from Nigeria. She stunned her teachers after picking up straight 9s under the new grading system for English literature, English language and maths, on top of one A* with distinction, five A* and three As in other subjects. Monkseaton headteacher Tracy Crowder said: “Once again, we are celebrating a great year of results from our students sitting GCSEs and we couldn’t be any more proud of what they have achieved. Students in North Tyneside are seeing their months of hard work pay off as the borough celebrates another great year of GCSE results. Both nationally and regionally, schools are expected to report that the major changes to the exam system have resulted in very different results to last year. This is primarily due to the new, more demanding content in both the maths and English GCSE courses and the removal of coursework from specifications, with assessments now done predominantly through exams. These changes mean that results can’t be compared to previous years. However, many pupils in North Tyneside have once again achieved good results this year, with the number of young people achieving grade 4 and above in English and maths at 65 per cent, which early indications suggest will be above the national average. North Tyneside’s Elected Mayor, Norma Redfearn, said: “North Tyneside’s young people have shown time and time again just how brilliant they are – and to get such great results, despite the changes being made to the GCSE system, is further proof of this. “From the head teachers and their staff, to the students, to the parents, everyone is committed to doing their best at all of our schools and they can be very proud of their efforts. Coun Ian Grayson, cabinet member for children, young people and learning, said: “These results are yet another achievement for young people in North Tyneside to be proud of, in what has been an incredibly tough year for high schools across the country. “Following on from our best ever A-Level results, and with over 90 per cent of our schools rated as ‘good’ or ‘outstanding’ by Ofsted, there aren’t many better places than North Tyneside for a young person’s education. George Stephenson High School, in Killingworth, saw 65 per cent of pupils achieve at least five GCSEs at A*-C equivalent, with 67 per cent achieving grade 4+ in both English and maths. Headteacher Ian Wilkinson said: “We are very proud of all our students. They have worked very hard throughout what has been a very difficult year for them and they deserve these excellent grades. At Norham High School, in North Shields, teachers and students celebrated the students’ results with an airport-themed party – where students could come along and collect their results before departing on to the next stage of their life. Student Jodie Tuffiin achieved A*/A in all of her subjects, as well as a grade 9 in maths. Delighted with her success, she said: “I’m really over the moon with my results, especially maths, which I got a 9 in. Meanwhile, at Churchill Community College, in Wallsend, staff got dressed up for a Wizard of Oz-themed party to celebrate the students’ results. Churchill also featured a number of students who achieved impressive grades, including in English and maths, as well as music, art and photography students achieving 100 per cent A*-C pass rate, and health and social care achieving 95 per cent. Among those very high achievers are Ellen Law who achieved 7 A*/A grades, as well as maths at Grade 9, Emily Swann who achieved 6 A*/A grades and maths at Grade 9, Georgina Mitchell achieved 7 A*/A grades, including in maths and English, as did Rhianna Sowerby. Artida Bajrami and Rebecca Hills achieved 6 at A*/A including in English and maths. Executive headteacher of both schools, David Baldwin, said: “Our GCSE students have done us all immensely proud with these results. “We set incredibly high standards for all of our students, and it is fantastic to see them work so hard to reach their full potential and achieve their goals. 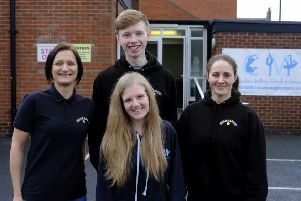 Whitley Bay High School students also performed exceptionally well, with more than 80 per cent achieving the new 9-4 grades in both English and maths. Headteacher of the school, Steve Wilson, said: “We are delighted to be celebrating another excellent year of GCSE results. “It really has been a fantastic couple of weeks for Whitley Bay High School, with this coming on the back of our best ever A-Level results. Included among the many success stories is Emma Dalhuijsen, who achieved the amazing combination of the new top grade 9 in both English language and maths alongside her five A* grades and three A grades. Emma is keen to study medicine and will be taking maths and the three sciences in Whitley Bay High School’s Sixth Form.